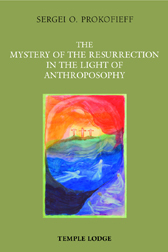 The Mystery of the Resurrection approaches the deepest mysteries of the Turning Point of Time through Rudolf Steiner's spiritual research. At its heart stands the question of the restoration of the 'phantom' of the physical body, and its transformation into the resurrected body of Christ through the Mystery of Golgotha. The author draws a broad and differentiated picture of the tasks and possibilities that the Easter event, as well as Ascension and Whitsun, present - both for the individual and humanity. The final chapter considers the mystery of Easter Saturday, through which the two polar aspects of the Mystery of Golgotha - death and resurrection - interconnect, at the same time explaining the relationship of the Earth Spirit to the interior of the Earth. An appendix tackles the phenomenon of stigmatization from a spiritual-scientific perspective. SERGEI O. PROKOFIEFF, born in Moscow in 1954, studied painting and art history at the Moscow School of Art. He encountered anthroposophy in his youth, and soon made the decision to devote his life to it. He has been active as an author and lecturer since 1982, and in 1991 he co-founded the Anthroposophical Society in Russia. In Easter 2001 he became a member of the Executive Council of the General Anthroposophical Society in Dornach. He is the author of many books, 22 of which are now available in English translation.